Calling him to labor at the break of day. 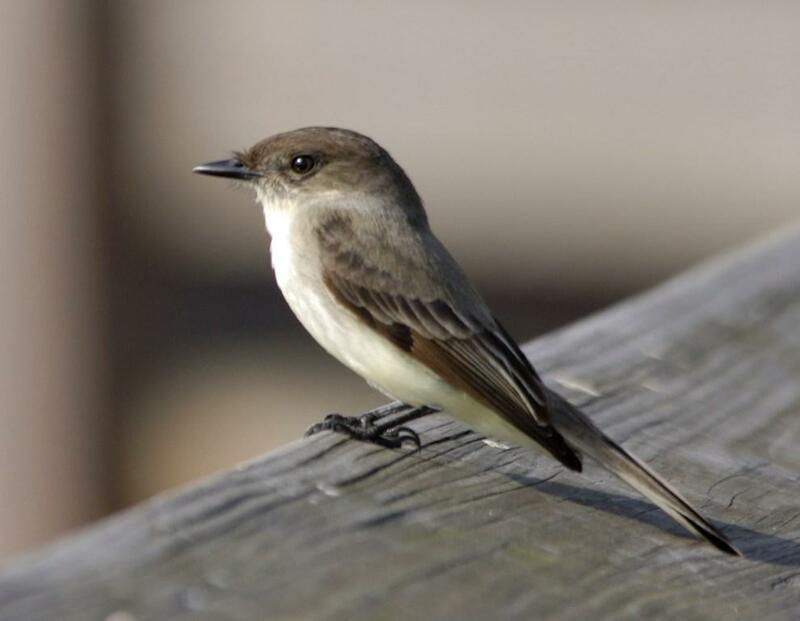 EARLY everywhere in the United States we find this cheerful bird, known as Pewee, Barn Pewee, Bridge Pewee, or Phoebe, or Pewit Flycatcher. “It is one of that charming coterie of the feathered tribe who cheer the abode of man with their presence.” There are few farmyards without a pair of Pewees, who do the farmer much service by lessening the number of flies about the barn, and by calling him to his work in the morning by their cheery notes. Dr. Brewer says that this species is attracted both to the vicinity of water and to the neighborhood of dwellings, probably for the same reason—the abundance of insects in either situation. They are a familiar, confiding, and gentle bird, attached to localities, and returning to them year after year. Their nests are found in sheltered situations, as under a bridge, a projecting rock, in the porches of houses, etc. They have been known to build on a small shelf in the porch of a dwelling, against the wall of a railroad station, within reach of the passengers, and under a projecting window-sill, in full view of the family, entirely unmoved by the presence of the latter at meal time. In its native woods the nest is of moss, mud, and grass placed on a rock, near and over running water; but in the vicinity of settlements and villages it is built on a horizontal bridge beam, or on timber supporting a porch or shed. The eggs are pure white, somewhat spotted. The notes, to some ears, are Phoebe, phoebe, pewit, phoebe! to others, of somewhat duller sense of hearing, perhaps, Pewee, pewee, pewee! We confess to a fancy that the latter is the better imitation. Range—Eastern North America; in winter south to Mexico and Cuba. 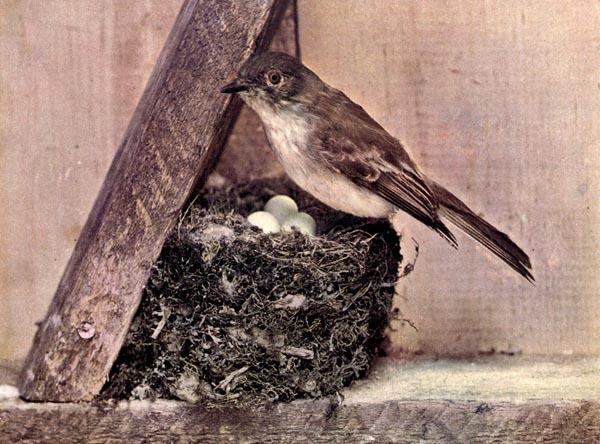 Nest—Compactly and neatly made of mud and vegetable substances, with lining of grass and feathers. Eggs—Four or five; pure white, sometimes sparsely spotted with reddish brown dots at larger end. Luckily today, at least here, we can ignore this one remark; “She advises: ‘Do not let the Phoebes build under the hoods of your windows, for their spongy nests harbor innumerable bird-lice, and under such circumstances your fly-screens will become infested and the house invaded.’ ” I am sure back in 1897 that was a problem for them. Isn’t it amazing how times have changed for humans, but the birds are pretty well doing the same nest building and living as before. Not sure of the interchange between the Phoebe and the Pewee. They are in the same family, Tyrannidae – Tyrant Flycatchers, but they are different species. The genus Sayornis is a small group of medium-sized insect-eating birds in the Tyrant flycatcher family Tyrranidae native to North and South America. They prefer semi-open or open areas. These birds wait on a perch and then catch insects in flight, also sometimes picking them up from the ground. Their nest is an open cup sometimes placed on man-made structures. They often slowly lower and raise their tails while perched. This entry was posted in Birds, Kid's Section and tagged Birds Illustrated by Color Photography, Birdwatching, Christian, From The Past, Home School, Kids, Nature, Pewee, Phoebe, Photography, Tyrannidae, Youth. Bookmark the permalink.